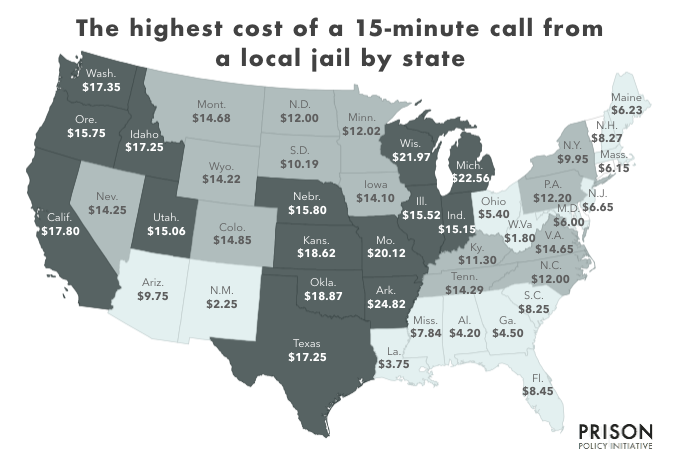 In some county jails, phone calls can cost up to $22 for 15 minutes, according to the report. Overall, Wisconsin ranks as the seventh highest at about $8 per 15 minute phone call. Yet, county by county, it can vary widely. And that makes Wisconsin stand out, said Wanda Bertram, communications strategist for the Prison Policy Initiative, a nonprofit, nonpartisan research organization that created the report. "There are more counties that really have the most egregious jail phone rates," she said. "But the average alone tells an important story because nationwide, the average 15-minute phone call from jail costs something closer to $5.61." Only Michigan and Arkansas out-charge Wisconsin on the highest cost for a 15-minute call. The people on the hook for the charges aren't the ones in jail, Bertram said. Rather, it's the family members and lawyers who receive the bill. And that can introduce a host of problems, she said, and it's important to note that the majority of people in jail haven't been convicted of a crime yet and are awaiting trial. "And what that means ... is that if you want to call your lawyer, call your loved ones, call your friends, anybody that might help you prepare that defense before trial, you're going to have to basically send them a bill," Bertram said. Minority and low-income communities are disproportionately affected, she said. For one, those groups are more likely to have a family member jailed. On top of that, they are more likely to not have a bank account, which can introduce further fees. When receiving a call from jail, per-minute phone rates are applied. But to take a call, you have to have an account to put money into, Bertram said. And if you don’t have a bank account to start one over the phone or online, many will pay by transferring money through Western Union or Moneygram, which will charge an extra fee, she said. For example, a $25 deposit to a Securus phone account — a company that provides phone call service to jails, including many in Wisconsin — will require a $12 fee to Western Union and Moneygram, according to the report. Bertram said that lawyers have argued that the costs could violate the 6th Amendment because it inhibits their ability to access clients. But why are these phone calls so expensive? Bertram said it comes down to the fact that people in jail are a captive market. "Partially because literally, they can't go anywhere, they have no choice but to use the phone," she said. "And there are only a few major jail phone providers in the country." Providers compete for contracts by offering commissions and kickbacks to jails, Bertram said, acknowledging that making ends meet at a jail in rural areas is difficult. "So in other words all of the revenue that's generated in a certain week or month by people making phone calls, some of that usually goes back to the jail," she said. Some state legislators have passed laws capping the cost of phone calls, but often the legislation is aimed at prisons, leaving jails out. In Wisconsin, the average rate for a 15-minute phone call from jail compared to prison is about four times higher, according to the report. "The language that we've seen be really effective elsewhere is if the legislation says that correctional facilities must negotiate their contracts on the basis of the lowest cost of the consumer," Bertram said.